The family unit is the cornerstone of any modern society. To live in family harmony is the ideal aim. To live with love and respect is critical to healthy family development. Most always the desire is there, but the ability often is not. Anytime a variety of personalities live together, perfect harmony is not easy to accomplish. Bring a new understanding as peace, love and tranquility enter you home with complete harmony between parents and children. 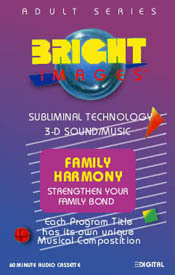 This program was designed to bring about the feelings of the family unit. Respect for each other, loving each other, respecting needs, giving, caring and sharing with each other. It is for children to respect their parents, to understand, appreciate and accept the decisions of their parents. It is for the parents to be proud of their children, to understand their children's decisions and to love their children. It is for the entire family to expect family growth, welcome individual growth and to share in that growth. You will laugh together, enjoy family entertainment, exercise and be concerned for each other's health. Being patient and sharing loving experiences seems to work the process out.